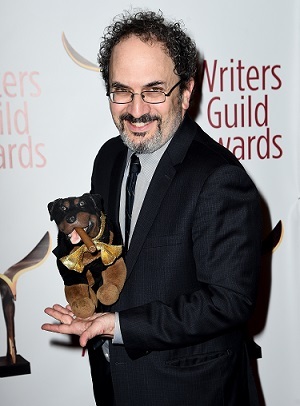 Robert Smigel is probably best known as the voice of Triumph the Insult Comic Dog. The creation of Triumph was conceived while Smigel was a head writer at "Late Night with Conan O'Brien" in the late 90's. Triumph's debut was in a recurring comedy skit about unusually talented dogs at the Westminster Kennel Club Dog Show. Triumph performed alongside dog sock puppets who played banjos, some performed magic tricks, and there was even plate spinners. With a cigar in his mouth Triumph closed out the sketch with his now iconic brand of comedy. Over the years, the character has returned to make fun of Star Wars nerds, start feuds with rappers like Eminem at the VMAs, and more recently heckling politicians for a hilarious election special. Smigel spent decades on Saturday Night Live as a writer, producer, and sometimes even had recurring roles -- he played Carl in the Bill Swerski's Superfans sketches. That's the one where the Chicago sports fans talk about their love of "DA Bears." Robert also the creator of an SNL staple – "Saturday TV Funhouse" – the recurring skit on SNL which features cartoons. Including: The Ambiguously Gay Duo, X-Presidents, and The All-New Adventures of Mr. T.
Now, Robert Smigel's a writer and director. Together with Adam Sandler and Chris Rock he made a new movie called "The Week Of." In it, Sandler plays Kenny, a working class guy from Long Island who can't really afford the wedding he'd like to give his daughter. Chris Rock plays Kirby, a heart surgeon from LA and the father of the groom. Kirby has the money to help out with everything, but Sandler's character has hard a time accepting it. Robert talks to Jesse about what it's like to be a father, and why he isn't sure his kids will find pleasure in the comedy he does as Triumph much longer. Plus, he breaks down what really happened when he was showrunning "The Dana Carvey" show. If you're a fan of Gillian Jacobs, it's probably because of her work in television. For six seasons, Gillian Jacobs played Britta Perry on the hit comedy show "Community." On the surface it was a show about a study group at a community college who are unlikely friends. But in a way "Community" was a television show about television and film conventions. It's full of meta-humor, parodies and messed around with typical television tropes. She also played Mimi-Rose on HBO's Girls. And on Netflix's Love, which just wrapped up its third and final season, she starred as Mickey. In her latest film "Ibiza," Gillian plays Harper. She's a quiet New Yorker in her early 30s who works at a PR firm. Her life changes when she gets sent on an important work trip to Barcelona, Spain. Harper brings along her two party animal friends - Nikki, played by Vanessa Bayer and Leah, played by Phoebe Robinson. The three friends take a trip to Ibiza, hundreds of miles away from where she's supposed to be. What could go wrong? Well, the film turns into a wild ride. Gillian tells us why Harper is the first character she's played that is most like her. Plus, she tell us how she found herself in high school theater. It's hard to make an interesting biopic about anything. Now, imagine having to make a film based around the last twenty-five years of the life and career of painter J. M. W. Turner. It has to be tough, right? 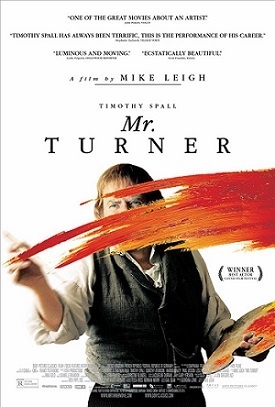 Making brushstrokes and landscape paintings interesting … well, director Mike Leigh nails it with the help of Timothy Spall's portrayal of Turner.